Bill and Beatrix sit around the camp fire. Bill: Once upon a time in the mountains of Andalucia, some believe, around the year twelvety dos, head priestess of the Fickle Lotus Toddler Clan, Bibsey Pai Mei, was (not) eating her breakfast, contemplating whatever it is that a toddler of Bibsey Pai Mei’s infinite power and wisdom contemplates – which is another way of saying “who knows?” – when her mother slave, Bibsey Mama, appeared from the kitchen, with milk for the cereal. As Bibsey Mama approached the table, Bibsey Pai Mei, in a practically unfathomable display of generosity, refrained from throwing her cereal bowl, and spoon collection, on the floor. This act of magnanimity, however, was not returned with an offer of a juice box and unlimited access to the goodie cupboard. Neither was Bibsey Pai Mei afforded the courtesy of being allowed to pour her own cereal and milk. Now was it the intention of Bibsey Mama to insult Bibsey Pai Mei? Or did she just fail to see the generous gesture? The motives of Bibsey Mama remain unknown. What is known, are the consequences. The next morning Bibsey Pai Mei appeared at the breakfast table and demanded cakie and chocolate for breakfast to repay the insult. Bibsey Mama at first tried to console Bibsey Pai Mei with Monkeys (Sugar Puffs) and warm frothy milk, only to find Bibsey Pai Mei was inconsolable. So began the Massacre of the Breakfast Table at the hands of the Fickle Lotus. And so began the legend of Bibsey Pai Mei’s five-point-palm-exploding-breakfast-cereal technique. Beatrix: And what, pray tell, is the five-point-palm-exploding-breakfast-cereal technique? Bill: Quite simply, the deadliest blow in all of toddler arts. She hits you with a cheeky grin and a wave at five different pressure points on your body. And then she lets you walk away. But after you’ve taken five steps, breakfast explodes behind you, and you fall to the floor, dead. Well, perhaps not dead, but covered top to toe in yogurt, cereal, milk and whatever else was to hand. 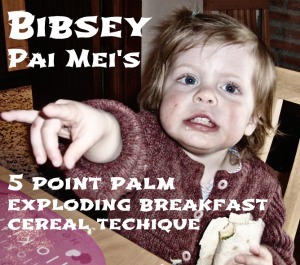 The question that you should be asking yourselves dear readers is: has Bibsey Pai Mei taught your toddler the five-point-palm-exploding-breakfast-cereal technique? You haven’t asked yourself this question? Then I leave you with this clip of one of Bibsey Pai Mei’s old students in action, by way of a cautionary tale.